Alan Joyce (Barker) has been put on a strict diet by his wife Marion (Prunella Scales) and is told that he has to last the entire day without any food. When she leaves he naturally heads straight off to the kitchen, but is appalled to find she’s taken every last scrap of food away. And heading out to the shops is going to be a problem, because she’s removed all his pairs of trousers too ….. Written by Barker, under the penname of Jack Goetz, it’s not a surprise that One Man’s Meat gives him the (ahem) plum role. 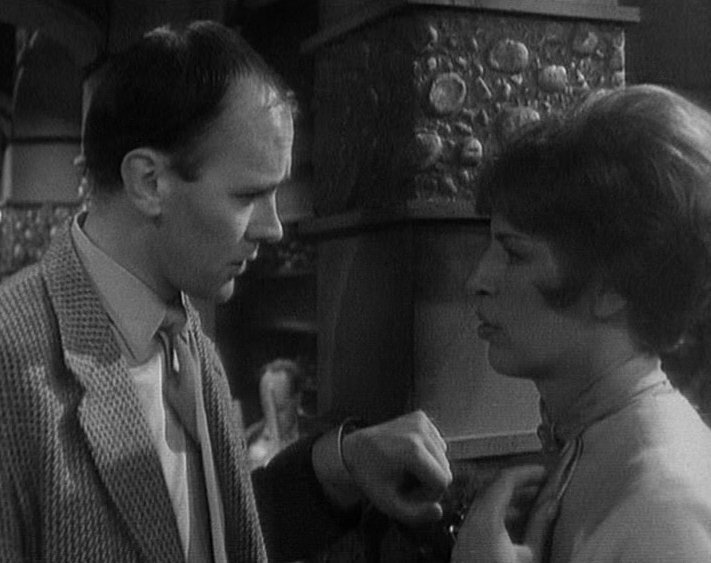 Despite the heavyweight supporting cast – Scales, Sam Kelly, Glynn Edwards, Barbara New and Joan Sims – Barker is by himself for a large part of the episode’s duration. Scales tops and tails the episode. It’s nothing to do with the story, but Marion mentions that they’ve recently seen a blue movie at Bill and Nora’s house – this shines a light into the ways that the respectable middle-classes entertained themselves during the 1970’s. Did they then indulge in a spot of wife swapping? That would have made an interesting story, but possibly a post watershed one. There’s more touchstones to the 1970’s as Alan mentions that he plans to fight the flab with Terry Wogan. He’s too late to catch him though, so has to put up with Jimmy Young instead. And since JY is delivering his latest recipe it’s all too much (he dunks the radio in the sink). Although Alan attempts to order a takeaway from a Chinese restaurant (cue slanty-eyed acting from Barker, another moment which helps to date the story) he appears to be unsuccessful. Presumably there were no other takeaways in the area? This is something of a story weakness. His desire for food then causes him to pretend he’s been burgled. Two policemen (Edwards & Kelly) turn up, with Alan eyeing their trousers enviously. It’s nice to see Sam Kelly and Glynn Edwards, even if they’ve not got a great deal to do. I wonder if this small role led to Kelly being cast as Bunny Warren in Porridge? The inimitable Joan Sims fairs a little better as the Joyce’s housekeeper, Mrs Dawkins. Barker gives her some good lines which allows Sims to deadpan with her usual skill, ensuring that her scenes with Barker are the undoubted highlight of the whole thirty minutes. Alas, she don’t appear for very long as Alan decides to steal Mrs Dawkins’ clothes, dress up as a woman and head out to the shops. When in doubt, drag up, I guess. One Man’s Meat has a sparkling cast and is a lovely time capsule of the seventies, but, like Alan’s stomach for most of the day, is a rather empty affair. However if the story doesn’t appeal then you always entertain yourself by counting how many times microphone shadows appear (director Harold Snoad must have been having an off day). Lessons opens with Barlow teaching a group of cadets how to work a murder scene. 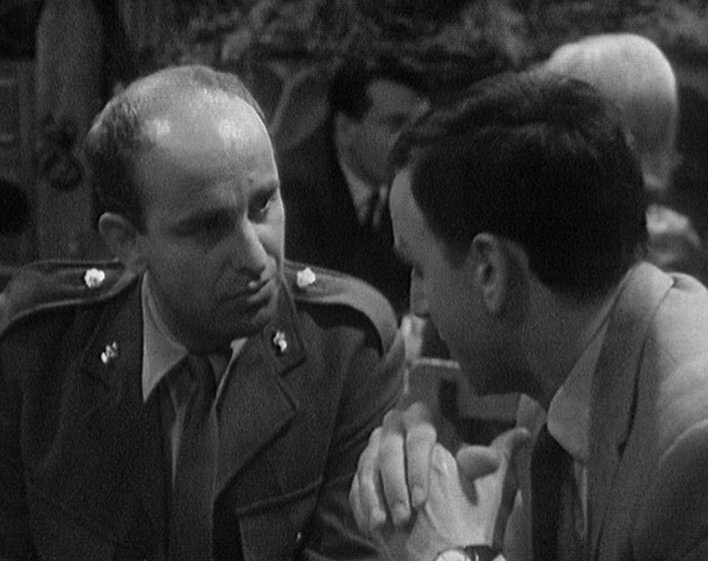 The training officer, Chief Inspector Fox (John Ringham), expresses his surprise to Watt that Barlow agreed so readily to play teacher, but Watt knows that Barlow is never more in his element than when he has an attentive audience. He covers all the essentials – don’t contaminate the crime scene, ensure that life really is extinct, etc – and thanks to his convivial, easy-going nature he seems to have got the message across. In story terms, it’s no surprise that a real-life murder is discovered shortly afterwards – now we’ll have the chance to see how well Barlow’s theories work in practice. The presence of Fox is also interesting. He’d been seconded to training for the last two years, but has just returned to active service. Fox has long desired to be back at the sharp end and now has his wish – but how will he shape up after such a long spell in the classroom? The discovery of the body – a girl’s naked corpse on the beach – is tightly filmed. We observe events from the viewpoint of the man who finds her. He spies a trail of clothes, leading to a fence partitioning two sides of the beach. After seeing an arm lolling out, he rushes over (at this point we don’t see the body) but by his expression it’s evident that something bad has happened. He rushes off for help, but the seafront is eerily deserted, so he hurries over to the nearest phone box. The picture then cuts to a quick reveal of the dead girl, before showing a grim-faced Barlow approaching the scene. This rapid cutting is an interesting choice – it’s a little jarring to jump ahead quite so quickly, but it helps to keep the story moving along. The girl is soon identified – Myra Vernon, aged fourteen. “A dangerous age” mutters Barlow. Her father (played by Glynn Edwards) looks very distraught after identifying the body, leading Barlow to offer him a drop of something. The lack of incidental music (the series never featured any) and the stark, sea-front setting makes the moment seem quite brutal. There’s some good character work in this story. Early on, Jackson and Evans are discussing the first murder case Barlow investigated in the area. Evans still feels sorrow for the murderer, considering him to be as much of a victim as the murdered child, something which Jackson doesn’t understand. And later at the murder scene there’s a brief scene between Jackson and Hawkins which serves to illuminate the Sergeant’s character a little more. After discussing whether Mr Vernon is the sort of person likely to go to pieces after learning that his daughter is dead, Jackson is easily able to banish this thought from his mind and go about his business. Hawkins calls him a hard case, whilst Jackson counters that he’s simply objective. Barlow’s irritation with Jackson is also made evident – the senior man is vaguely contemptuous that the Sergeant has little practical knowledge of the nitty-gritty of policework (he’s never worked directly on a murder enquiry, for example). Jackson may be a decent administrator, but he’s not a thief-catcher, which explains Barlow’s regular baiting of him. Cadet Wellbeloved (Crispin Gillbard) had earlier played the body in Barlow’s training exercise, but now he’s of even more use. As a local man, he knows that the tide on this part of the beach will be coming in very soon (and not in two hours time, as the tide books report). This means there’s something of a scramble to document all the evidence before it’s washed away. Fox is perturbed that they’re not following the correct procedure, but Barlow tells him that it’s the “difference between textbook and the real thing, Mr Fox. Tides wait for no man”. Lessons was the first episode of SS:TF to be shot entirety on film. Dixon of Dock Green had also begun to do the same thing at around this time (the first all-film Dixon, Waste Land, aired a month after this). It helps to give the story a very different feel, although this effectiveness is somewhat blunted by the rather poor picture quality. The above screen-shot shows just how faded the colours are. It’s a slight pity, but considering that many other series from around this time (especially Dixon) are poorly represented in the archives, the fact that every episode of SS:TF still exists is rather amazing (so if some are rather dog-eared, that’s better than them not being around at all). Arnold Yarrow was something of a renaissance man. He penned several episodes of SS:TF whilst working as the story editor at the same time. And when he wasn’t wearing those two hats, he also pursued a successful acting career. For me he’ll forever be plucky Bellal from the Jon Pertwee Doctor Who story Death to the Daleks. With a very limited cast of suspects, Lessons isn’t a whodunnit. Yarrow’s script focuses on the procedural nature of a murder enquiry and also serves as a good vehicle for the regulars (Yarrow’s familiarity with the characters, due to his work as the show’s story editor, no doubt had something to do with this).